A new benchmark has to be set. 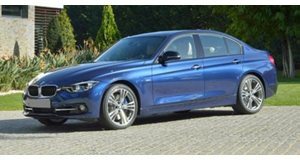 A lot has happened since the current F30 generation BMW 3 Series went on sale back in 2011. Despite a recent mid-life update, the always benchmarked by competitors 3 Series is still showing its age. That fresh competition has consisted of an all-new Mercedes-Benz C-Class, Cadillac ATS, and the Alfa Romeo Giulia. BMW is currently in advanced development of the next generation 3 Series, codenamed G20, which is due to arrive in 2019. That may seem like a long way out, but in this industry it’s really not. Spotter Automotive Mike has snagged some footage of the new 3 Series doing test runs at the Nurburgring. Despite its camo-ed body, the long hood, short rear deck shape that’s defined the 3 Series from the beginning remains. We’re told weight reduction has been a major focus for engineers, with an estimated 88 pounds being shaved off compared to today’s car. Even greater use of aluminum and carbon fiber reinforced plastic (CFRP) is being utilized to make that possible. Like the larger 5 and 7 Series, the G20 3 Series rides on BMW’s CLAR platform, although it’s been shortened in this case. Expect to see the continuation of the plug-in hybrid model, which will be offered in two output flavors, 226 hp or 261 hp. BMW will also launch a pair of new performance models, the M340i and M340d, both of which will slot below the M3. Since we’re on that subject, the next M3 is rumored to come equipped with a small electric motor providing an additional 28 hp or so, boosting output to over 450 hp.